Grab your bikes and invite your friends & family – it’s time for the annual Bike About Town rides! 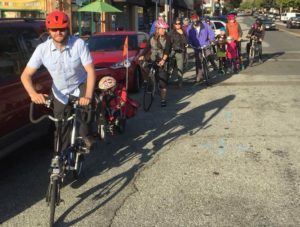 Join the City of Albany’s Department of Recreation and a bunch of your fellow Rollers as we explore Albany by bike on Spring, Summer and Autumn evenings. Each of the events will trace different routes that pass through parts of Albany you may not have biked before. All levels of cyclists are encouraged to join. 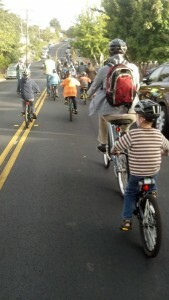 The ride begins at 6:30 at Bikes on Solano at Solano and Peralta in Albany. We ALWAYS need Ride Guides to help guide folks around town from the front, middle and back so if you’re a confident rider please come 10 minutes early and help your neighbors out! Come a few minutes early to pump up your tires. Ride maps are distributed, and we take off in a big group. There are experienced cyclists to lead and bring up the rear. After wheeling about for a half hour or forty-five minutes we return to Peralta Park, just across the street from our start, for light refreshments, a raffle, and general carousing. Thanks so much to the Chelle, Eva, Liam and Brennen with City’s Department of Recreation & Community Services for organizing, printing maps and getting the FABULOUS RAFFLE PRIZES for riders! 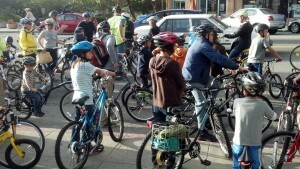 Bring yourself, your friends and your family to Bikes on Solano for the Bike About Town rides!